These scrap wood in my shop is simply never ending. The shorter pieces tend to wind up in the miter saw stand where I keep my scrap bin. If you haven’t already, you can check out how I built the stand here. Although my scrap bin gets a lot of action, there are plenty of longer or larger pieces of wood which simply will not fit in my scrap bin. Solution: A burn barrel! 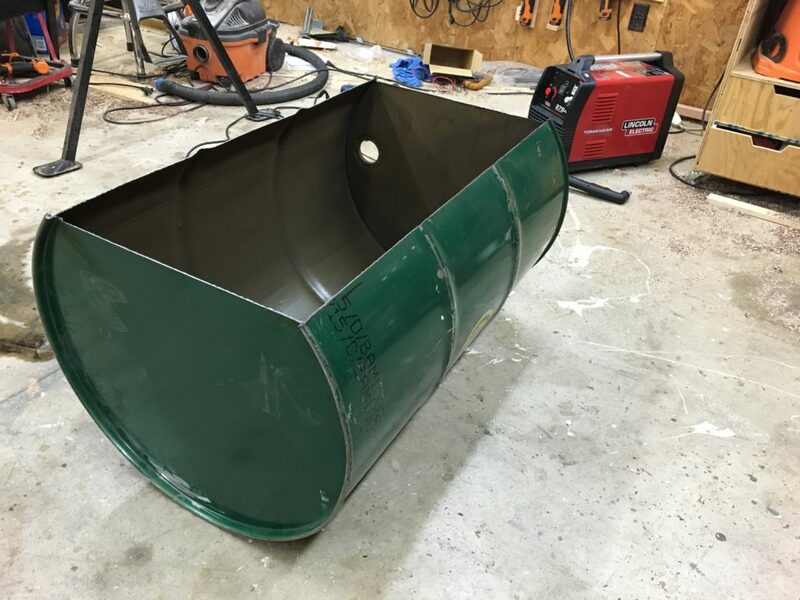 The timing for this project is perfect since I just received a new Lincoln Electric Plasma cutter which will work excellently for building a dedicated scrap wood burn barrel. First things first, I needed to decide on a design. I had a pretty good feeling I would use a 55 gallon barrel as the main pit so my focus was on what type of foundation I wanted it to rest on. After looking on the google box for some design inspiration, I was leaning toward a design that somewhat resembled an old cast iron sewing machine base. 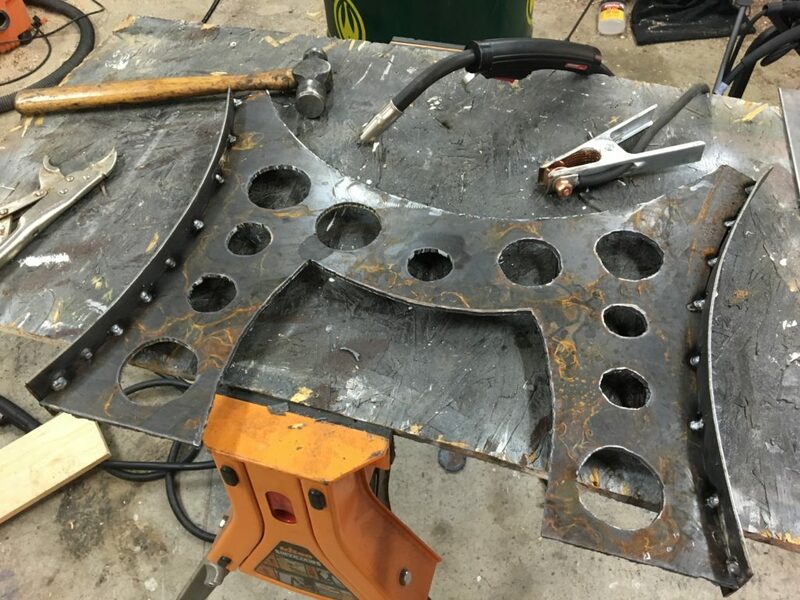 With the design kinda narrowed down I reached out to a local steel company and rounded up four pieces of 10 gage plate steel that I used for the base. Fortunately I found a couple of barrels on a local sales website for 20$ each. I bought two of them just in case I made a huge mistake and ruined the first one. Lincoln electric recently sent me a new plasma cutter so I was anxious to start cutting out some shapes. I chose to practice on some small piece of 2” flatbar I had in the shop to get the feeling of how to operate the machine. After about 5 minutes of cutting through strap, I felt good enough to go ahead and commit to cutting on the actual project. Anyhow, the barrel was super easy to cut through and took maybe 15 minutes to cut out the section I laid out. I used a piece of flat-bar clamped to the barrel as a straight edge guide that worked perfectly for keeping a nice clean cut. I then turned my attention toward making the base. The base is made from two large plates from the plate material I mentioned earlier. The plate steel that I got from a friend comes from the bit of scrap left over after making large diameter circular cut outs for tank lids. After looking at it, I decided I would use the shape to my advantage since it was already kind of inline with the shape I ultimately wanted. However I wanted to add some circular cut outs to break up the space and I also needed to cut the shape of the barrel into it. I used a large piece of cardboard to trace out the section of the barrel that would rest on the two bases. After cutting the traced line out, I used the cardboard template as a guide for tracing out the shape on the steel, and as a guide for my torch head. Fortunately, the head of this torch is so well insulated, the cardboard was totally unaffected; which is good to know for future projects. Cutting the circles was a bit more tedious than I originally thought. I decided to make a couple of circular blanks out of wood and use them as a guide for my plasma wand. This really helped to keep cutting head nice and smooth and kept the circles from having too choppy of a profile. Following all the circle cut-outs, I had three more cuts to make; the bottom cut which established the height of the base, and a couple of interior cuts to add to the middle shape of the base. These cuts were pretty easy and did not require the use of a straight edge. I simply free handed all of them and they came out pretty nice. 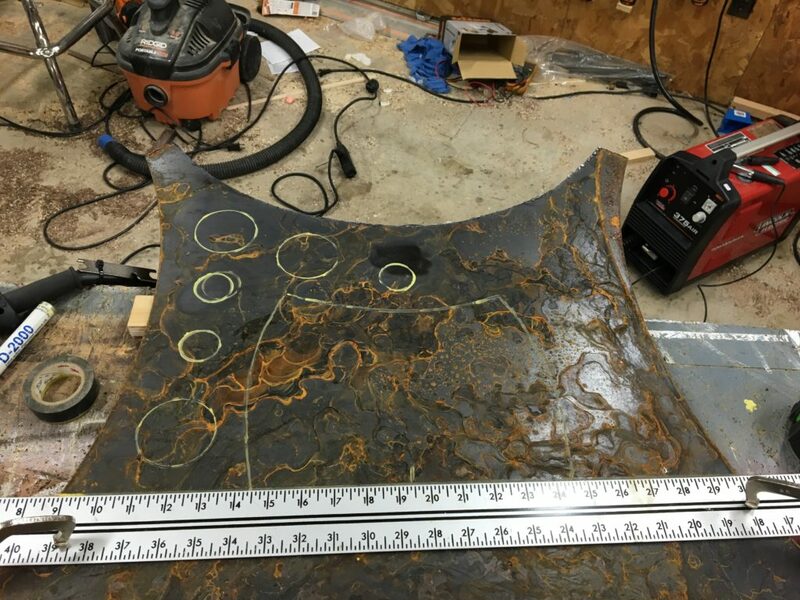 After all the cutting with the plasma torch was complete, I cleaned up all of the perimeter edges with an angle grinder and then used a pneumatic die grinder to get inside of the circles and clean up those edges also. Although the plasma cutter is known for creating super clean cut lines, I preferred touching everything up so the project has a nice finished feel to it. I used the first completed plate as a template for the remaining side by simply tracing out the entire shape onto the remaining plate material I had. From there, I just repeated all of the steps once again to complete the second and final plate. I was now ready to focus on the “trim work” if you will. I chose to use 2” flat bar (also called “strap”) as a kind of edge banding for the plate material. This part was especially fun because it required bending and shaping the steel into the shape of the perimeter of the plate. I started the process of trimming it out by first tack-welding one end of the strap to the plate and then hammering the strap along the curve shape of the plate. Once it was hammered into the general shape of the plate, I would clamp the strap to the plate and simply stitch weld a series of tacks all along the length of the strap. I got into a sort of rhythm when doing the trim work and repeated the process for all sides of the plate material. I must admit that I was pretty darn happy with how these came out. I have very limited experience with metal working so for these to come out so closely to what I had envisioned is very satisfying. As you know, the same steps were repeated for the remaining side before I was ready to attach them to the barrel. Welding the two bases on however was very easy. I rolled the barrel onto the section I cut out earlier and then ground away a bit of paint where the two bases will be welded in place. To hold the first base in place I temporarily held the base with a right angle magnet, made sure it was level then put down a small tack weld. After a little double check, I welded the rest of if, again using the short stitch welds on both sides of the 10 gage plate. The opposite side got the exact same treatment. With both of the ends attached, I went ahead and welded a cross member between the two plates just to give it a bit more rigidity. Without the cross member, it would probably be a bit on the flimsy side….and we just can’t have that : ) After ward, I stood her up! How cool – this thing is super sturdy and nearly complete. This project was more fun than I originally thought it would be. I was a bit nervous about the plasma cutting but the little machine I used made it super easy to get over the nervousness and just get the work done. Thanks for taking the time to check this project out and I encourage you to give it a try if you’re interested. Happy making!